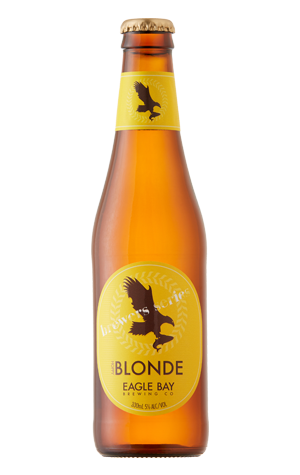 Eagle Bay Brewing Co’s Brewers Series follows the seasons and the summer offering for 2018 is a Hoppy Blonde – presumably lightly dusted with salt spray from a morning’s surf at 3 Bears. With a casual cool, this release slipped out of the brewery early in the New Year and quickly became a bestseller. Much like it’s new Lager sibling, this is a crisp drop albeit with a slight haze much like the summer heat wave-fueled mirage to be found on Eagle Bay Road. Tropical fruit and light citrus arrive courtesy of Simcoe, Azacca and Sticklebract hops upon a slightly sweet caramel, four malt base. The medium mouthfeel is lightened by a persistent, drying carbonation and firm bitterness that feels bigger than its 32 IBUs, creating a beer that’s infinitely drinkable and exactly the type of limited release that could become a core range beer – if it wasn’t so laid back. The Hoppy Blonde is available until Autumn from the brewery plus venues, retailers and growler filling locations around Western Australia.